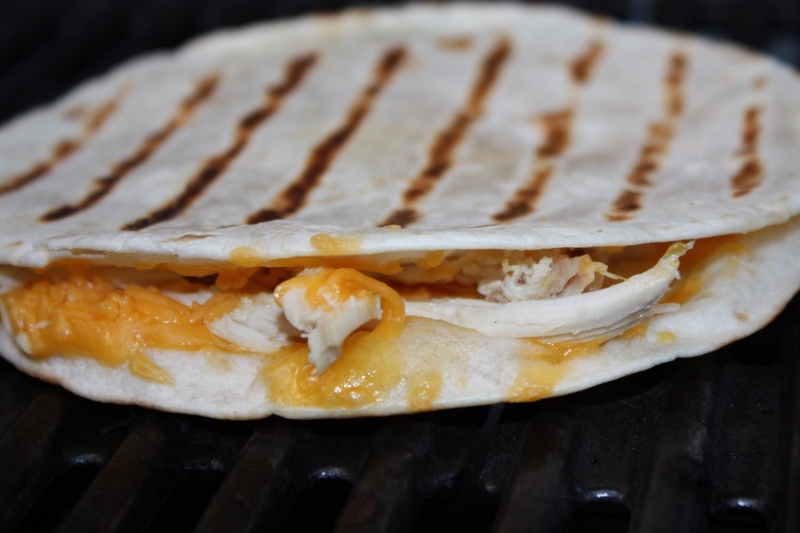 Chicken quesadillas on the grill can be super easy and quite appealing to your taste buds. The best part about them is that they take no time at all when they are on the grill! I am working with flour tortillas, but corn is also an excellent alternative. Cheddar cheese is my go to when creating chicken quesadillas, but feel free to be as adventurous as you want! I buy precooked chicken at the store to use on my quesadilla. Once you have those three things you are all set to get going on the Q! Preheat your grill on high for 10 minutes before you get going. While the grill is in the preheating stages, prep your quesadilla. Take your two quesadillas and cover the surface of one of the tortillas with your chicken and your cheese. I like to add more cheese than chicken because I like when the cheese covers up the entire surface area of the tortilla once it is melted. Once you cover your tortilla with enough cheese and chicken that tickles your fancy, place the other tortilla on top. Once the grill is finished preheating, scrape off any excess food that is on your grates and make sure the temperature is no higher that 300 degrees, before placing your quesadilla on the grill. Quesadillas don’t take long, but it is better to go low and slow and fast and burnt, so the cheese melts and the tortilla is grilled to the perfect crisp. A tip I find helpful when placing the quesadilla onto the grill is lifting the lid of the grill and then bringing the plate you have the quesadilla on close enough to the grate so you can tilt the plate to help guide the quesadilla onto the grate with the help of your spatula so you can nicely place the quesadilla on the grill without all your cheese and chicken falling off. Grill for 2 minutes on each side. If the cheese is not melted you can leave the quesadilla on for another minute on low indirect. Then use your spatula to remove the quesadilla from the grill and put on a plate to cool for about 2 minutes. Once cooled, slice your quesadilla into halves, 1/4s, or leave it as a whole. Now it is time to enjoy! Often times, I like filling up a small bowl of guacamole, salsa, or sour cream to top my chicken quesadilla with!